Together with seven cooks from refugee countries of origin, star chef Tony Hohlfeld and restaurant critic Robert Kroth have cooked, experimented, and developed brand-new recipes. How well suited are the star chef’s “50 Rezepte für mehr Miteinander” (i.e. 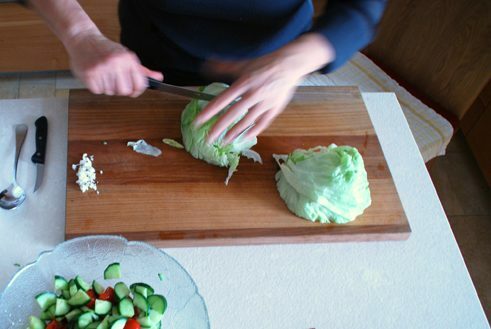 50 recipes for greater togetherness) for our own kitchens? 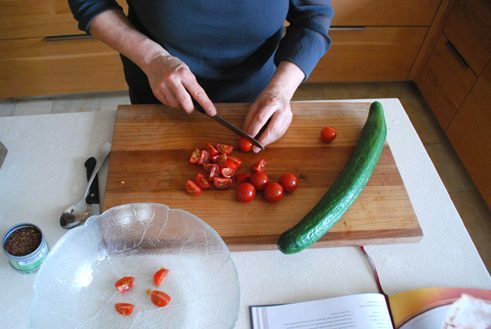 Author Andrea Gehwolf has tried them out, together with her mother Martina, a vocational school teacher who among other things teaches cooking. How can we come in contact with people from other cultures seeking a new homeland in Germany, and share with them? What connects us? For restaurant critic and book author Robert Kroth the answer was not far off – Food. „Food is its own language, food connects, sparks curiosity, tells stories.“ And even if we are bot sitting directly at the table in convivial company with our new neighbours their dishes still convey a bit of their homeland, their culture, to us. My mother and I bring the tastes of Syria and Nepal into our kitchen. “Cooking requires time, love and imagination,” states the Neue Nachbarn Kochbuch (i.e. New Neighbours Cookbook). 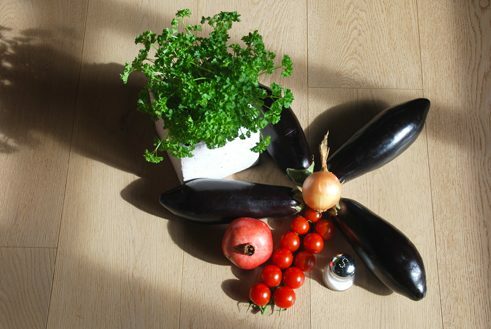 Pleasure in experimentation and curiosity are also part of it, above all in Germany where unfamiliar ingredients are concerned, some of which are not so easy to obtain. Wash and dice tomatoes and cucumber. Chop the garlic very fine or use a garlic press. Chop the parsley and mint. 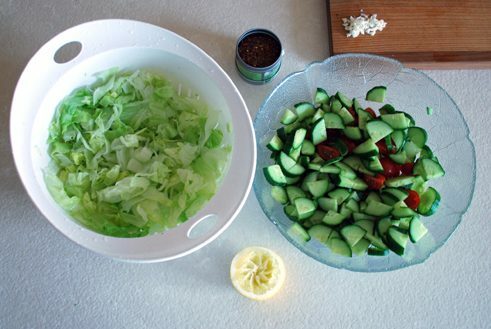 Wash the lettuce, cut in strips and add to the other ingredients in a salad bowl. 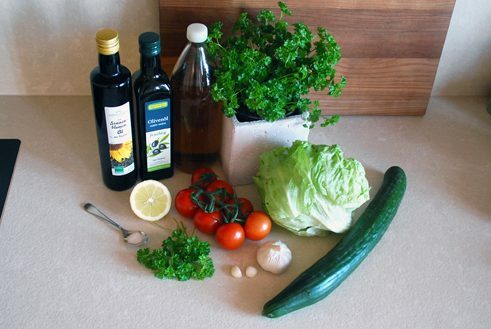 Mix the vinegar, olive oil and salt into a dressing. 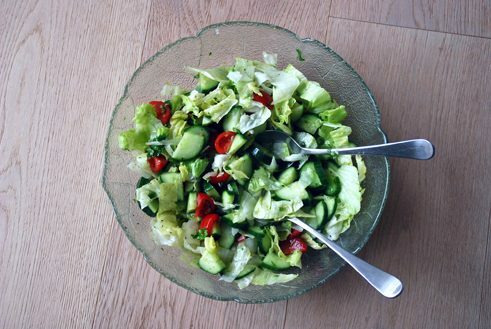 This salad is versatile. Individual ingredients can be added or left out according to taste. For instance, the original recipe contains 100g black olives. Serve with flatbread. Unlike myself, my mother is a very good ccook. We both like to improvise, although from different motivations. She, because she mostly knows better, I because I don’t know better. Thus with Fatoush, an Arab salad, we simply leave out what I don’t like: the olives. „The only unusual ingredient is the mint. But the intense garlic taste is also conspicuous“, my mother finds. Chubz, Arab flatbread, is the perfect side dish for it. Can one simply make it oneself? „Basically, it’s a perfectly normal yeast dough that is fried in a pan without grease after being left to rise for a while.“ However, the lack of grease in the pan took my mother somewhat aback, and she greases the pan with a towel with some olive oil to be on the safe side. The bread looks different from the book, as do all our dishes, but tastes excellent. „Cooking together is like a team sport“, says Tony Hohlfeld, with whom seven cooks from Algeria, The Gambia, Iran, Sudan, Syria, Nepal and Pakistan have shared their experience and traditions. They were all professional cooks in their home countries before they fled to Germany. The authors met them in church community centres, gymnasiums and tent camps, and all were instantly thrilled by the book project. While cooking with them, Tony Hohlfeld let himself be inspired and created new dishes that enrich our culinary culture. We have tried out some of the recipes in this spirit: opening up to the unfamiliar, but at the same time trusting in our own feelings and sense of taste. Instead of pomegranate syrup my mother refined the eggplant creme Baba Ganoush with homemade raspberry marmalade – a bit of Syria, a bit of Germany. 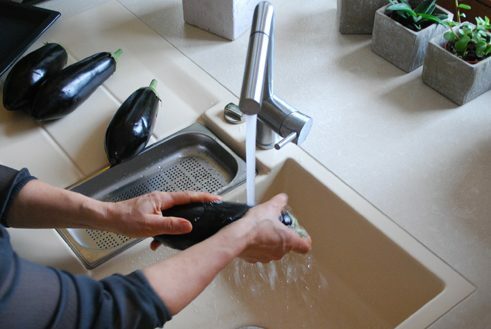 Wash the eggplants and pierce several times with a knife. Bake on an oven sheet for about 20 min. at 200 C°. 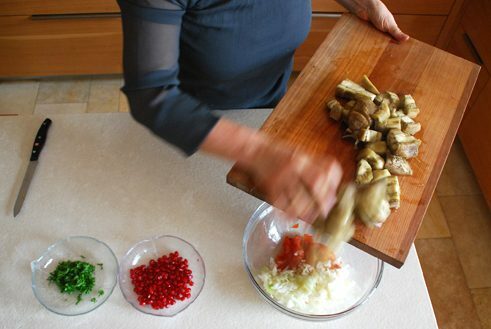 Dice tomatoes and onions, chop parsley and remove seeds from the pomegranate. 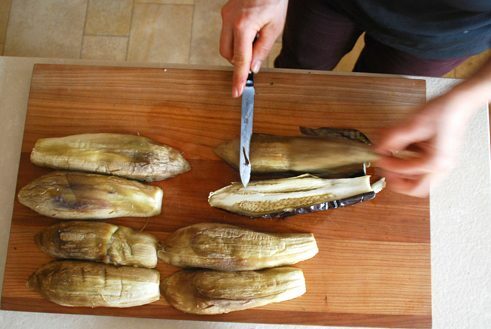 Take the eggplants out of the oven and peel off the skins. Slice the eggplants and add to the tomatoes and onions. Mix the pomegranate syrup (or alternatively some raspberry marmalade) with the salt and other ingredients into a creamy mass. Stir in 3 tbsp pomegranate seeds and the parsley. Overall, the recipes in the Neue Nachbarn Kochbuch are not at all as exotic as one might think, even if some of them process special ingredients into surprising combinations – for instance carrots in a dessert – a fantastic discovery. And plenty of room for interpretation: dried prunes and raisins are replaced with dried cranberries, and instead of mango puree from a non-existent Asia shop nearby, we simply put a fresh mango in the blender, of the 25 grams of cardamom seeds we use a good one-tenth or so. Since only a very few households have dessert rings to shape the little cakes, we pour the mass into small marmalade glasses. Despite our very free interpretation of the recipe the Nepalese carrot dessert Gajar Halwa tastes very good. And looks very pretty, too! The selected recipes are very flexible and the portions generous, something that one might not necessarily expect from a star chef’s recipe. The instructions are presented in a clear and understandable style, and the pictures create appetite for more. The cooks and their national cuisines are depicted in individual portraits. A culinary voyage of discovery with a well-designed cookbook. Profits from sales of the book go to the non-profit association HELDEN e.V for the refugee project HAPPY BOX. Andrea Gehwolf works as a free-lance author and editor in Munich. However, the cooking was done in her parents’ kitchen in Lower Bavaria. There’s not one single Asia shop there far and wide, and the fresh mint for the salad was not to be found, either. Instead of cooking herself, she hustled her mother through the kitchen because she was busy the entire time taking pictures and filming. She liked the Nepalese dessert best although it was complicated to make.